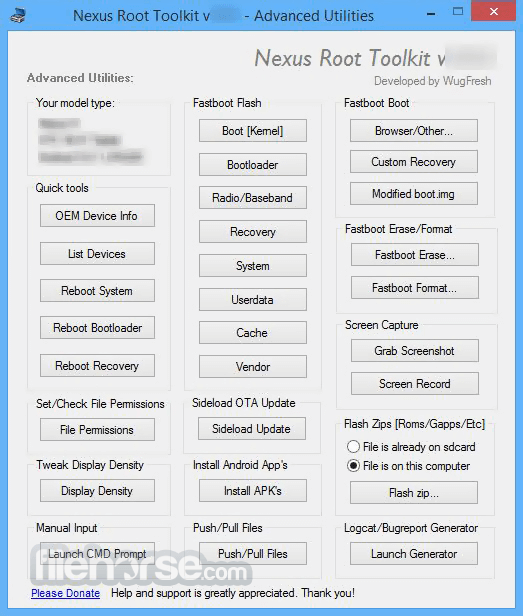 Nexus Root Toolkit includes a full featured interface for automating tasks in TWRP, enhanced restore features, an in-built auto-updater/notification system, ‘any build’ mode, advanced restore features,’NRT- Live Log’ for viewing the adb/fastboot cmds that are run in the background, quick tools utilities, utility set for merging custom build.prop tweaks, and tools for taking screenshots/screen-recordings. All the latest official Android builds and Nexus devices are supported. The program intelligently and selectively downloads the files it needs for your device and makes sure you are using the latest files available. The program can even auto-detect your device and build. This release brings official Nougat support for the recently released factory image packages, and a quick fix for XP users. Auto-download all required files with hashcheck verification. 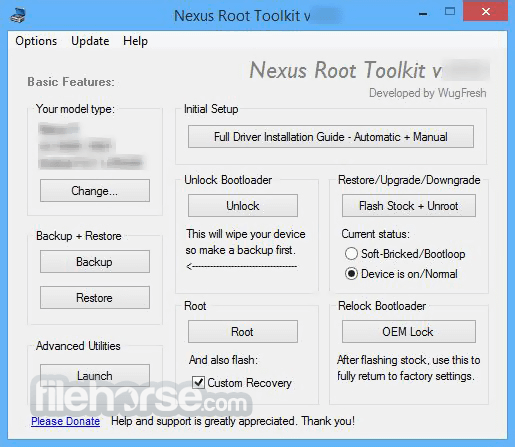 Automatically root any build on all Nexus devices. Restore/Upgrade/Downgrade to any android build. Recover device from softbrick/bootlooped state. Intelligent device/bootlaoder variable checking to prevent flashing incompatible firmware. Dual-mode ADB/Fastboot intelligent connectivity checking. Create Android Backup files for individual or all apps. Backup & Restore Virtual SDcard. Backup & Restore SMS, Call Logs, APN. Create Full Nandroid Backup with Custom Recovery. Fastboot Flash IMG files to any device partition. Fastboot Boot IMG files (Boot.img/Recovery.img). Fastboot Boot Custom or Stock Recovery. Push/Pull files to any device partition. Push/Pull on-device hashcheck verification system to ensure complete operations. Merge and manage custom build.prop tweaks.